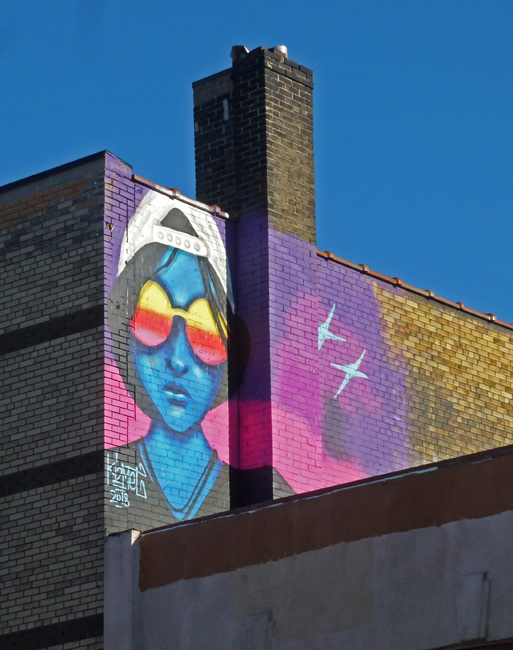 I spotted this new mural high up on a wall along Bloor St in Koreatown on a clear but cool day. The artist for this one is Kizmet who has done a lot of murals in the city so I will have to look for more of them. Very colorful - I like it! Toronto must have a great supply of wonderful murals. You seem to find them regularly. Have a great week. Shades of red with a blue face and a white baseball cap turned backwards. You do find some interesting works. And yes, there are indeed gators in that water. Stay tuned! She's looking pretty cool with those colorful shades on! Love the bright rainbow effect of this piece! Cool! Happy mural, esp with that blue sky! Keeping eyes over the city! a very cool and colourful mural. I love the shades. You have some very talented artists working the streets up there. A great find RedPat, and a very "cool" mural. Thanks for participating. Colourful and up high where it is easy to spot. Always unexpected to see this rising above a wall. Nice and colorful. Nice spot for a mural!